U.S. markets point to a second day of gains Thursday, as strong Chinese export data and hope about corporate earnings give stocks a boost. U.S. stock futures edged higher ahead of the opening bell. Investors may react to a new number on the labor market out Thursday. The number of people filing for initial jobless claims rose 4,000 to 371,000 in latest week, U.S. government says. No S&P 500 companies are scheduled to report quarterly results. Wells Fargo (WFC) will report Friday, making it the first major financial institution to release its fourth-quarter figures. Overall, analysts expect earnings for companies in the S&P 500 to grow 3.3% in the fourth quarter versus last year, according to S&P Capital IQ. Banks and companies in the consumer sector are expected to lead earnings growth. A better-than-expected start to the corporate earnings deluge caused stocks to end higher Wednesday. The Dow Jones Industrial Average gained nearly 0.5%, the S&P 500 rose 0.2% and the Nasdaq added 0.4%. In other corporate news, nutritional supplement company Herbalife (HLF) is expected to respond to charges from hedge fund manager Bill Ackman that it's running a pyramid scheme. Grocery store chain Supervalu (SVU) will report its quarterly results in the morning. Shares of Nokia (NOK) were up more than 20% in premarket trading, after the phone company reported better-than-expected earnings for its handset business. European markets were mixed in morning trading. 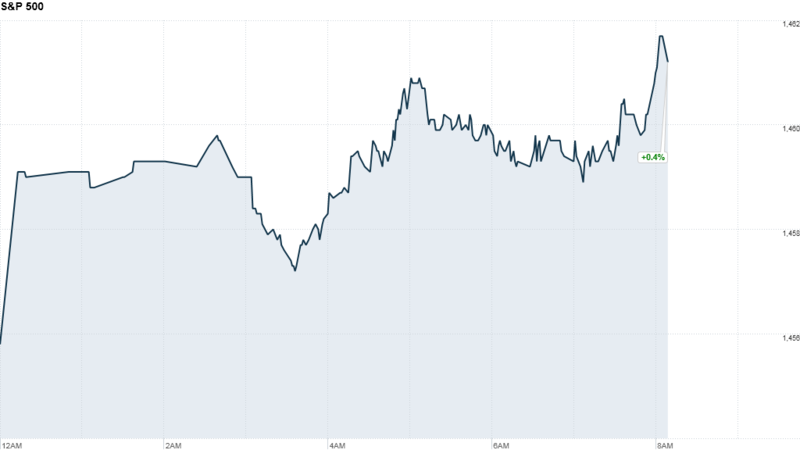 The FTSE100 and Germany's DAX were steady, but France's CAC 40 slipped. Both the European Central Bank and the Bank of England held interest rates at record lows on Thursday morning. The ECB also cut its forecast for the eurozone economy. Asian markets ended up on the day following positive trade data from China. Exports were up 14% in December over last year, China's government said in a report that topped expectations. The Shanghai Composite added 0.4%, the Nikkei advanced 0.7% and the Hang Seng jumped 0.6%.